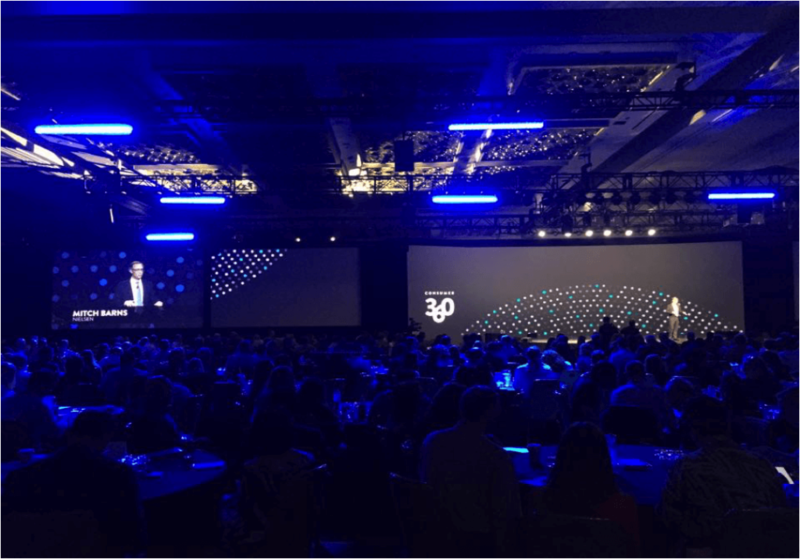 For the second year in a row, Nielsen asked ASL Productions to cover their mega conference, Consumer 360. The conference brings together leaders in the Consumer Packages Goods (CPG) and media world to gain insight into business solutions for today’s rapidly evolving markets. ASL was responsible for covering every facet of the event, and creating a highlight reel to be shown on the morning of the final day to recap the most exciting moments and energize the audience for the learning’s ahead. ASL put a lot of work in to preparing for C360. There was schedules logistics to organize, equipment needs to sort out, and personnel to hire to help cover an event of this magnitude. 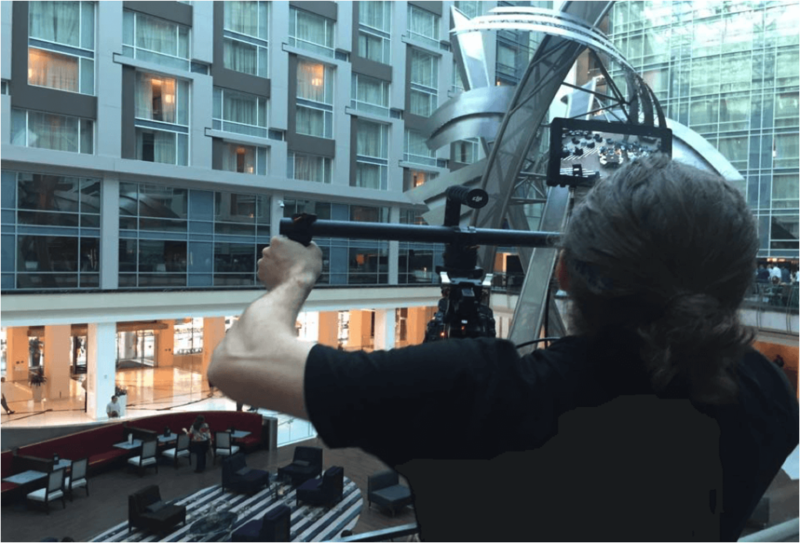 Every detail had to be ironed out before traveling to the, brand new, Marriott Marquis in Washington D.C. where C360 was held. We had a team of ten people on site and everyone was working from morning until night. We split our group into three, three-man teams and one full time editor organizing and cutting clips as the footage came in. Each crew consisted of a camera operator, producer, and production assistant. In addition to tripods, our camera operators were equipped with dolly/sliders for more artistic shots. We also used one of our favorite new tools, the DJI Ronin camera gimbal stabilizer. 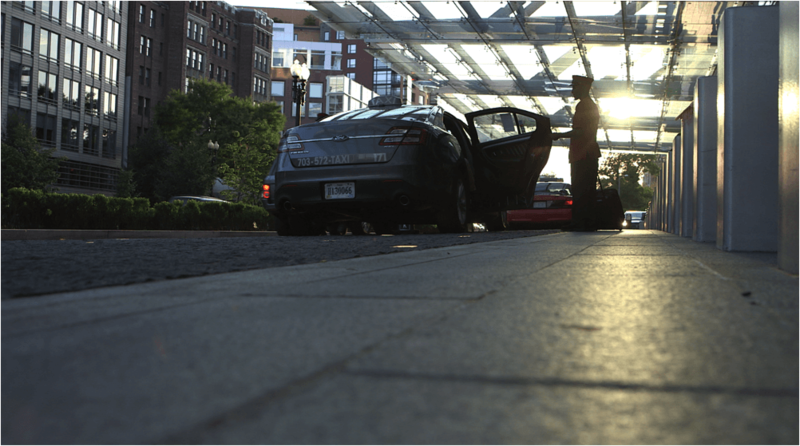 The Ronin allows us to capture footage on the move while keeping the camera in perfect balance. Our audio engineer, outfitted each crew with a boom and lavalier microphone. Lighting was another area where we planned ahead. We equipped each crew with a lite-panel bi-color astra light, on a wheeled stand so we could move quickly. The Asta provided many benefits to production. It can run off battery power so we didn’t have to run dangerous cables along the floor. The light has a built in dimmer and adjustable color temperature controls so no matter where we were in the facility, we could make sure our subjects looked great. The first day we covered events that included speed networking, a Nielsen alumni reception, a first-timer’s gala and a large cocktail gathering on the mezzanine level of the hotel overlooking the gorgeous lobby sculpture. Before we called it a day we set up a motion time-lapse of the sun setting in front of the hotel, using our one man crew, curved slider system. The second day was where most of the action took place. 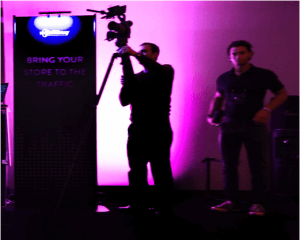 The day kicked off with a general session where we had four camera set ups, a close-up, a wide shot, a crowd cutaway angle and our Ronin operator picking up dramatic shots of speakers entering the stage. Daniel Zhang, CEO of Alibaba Group, Alison Lewis, CMO of Johnson & Johnson Consumer Company and Colin Powell were just some of the prestigious speakers during the morning session. After the morning general session, we had to arm the crews for breakout panel talks. These, more intimate and specialized, seminars focused on specific aspects of the, “Invent Tomorrow,” theme Nielsen was using for C360. We had a dedicated audio operator run XLR cable from each room’s audio boards, to our cameras in order to have a clean audio feed. In addition the audio op tested each lav and boom mic, which were held by the production assistant and provided instructions for switching from the audio feed to interview microphones. The third member of the crew had their interview questions ready and was in charge of tracking people down and asking them if they wanted to be interviewed. At coordinated points throughout the day our production assistant would replace the cf card that our ftg records to and run the filmed footage to our editor. 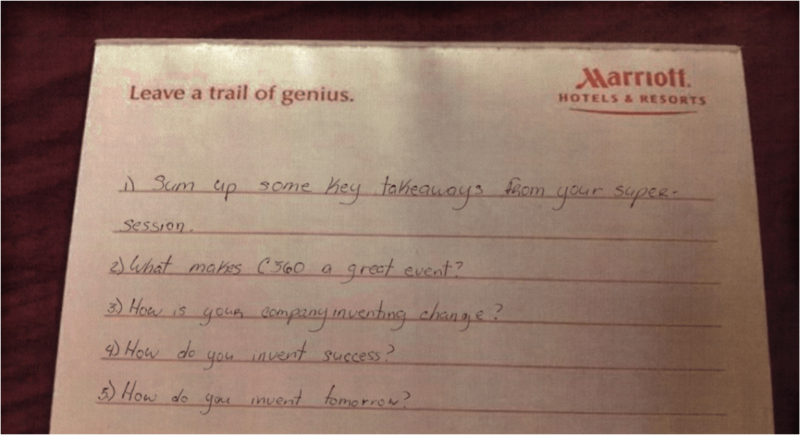 After gathering the super sessions and one on one interview content, our work was not done. We had our producers sorting through the footage in an attempt to get the best visual and audio bites to use in our highlight reel. As a producer, you want to find the best audio and visual clips that come together and tell a story. Nielsen brought a plethora of experts and executives together to explain and showcase how to navigate the massive amount of information that comes at us daily in our current digital age. All our producers needed to do was look through the footage and b-roll to fill in the gaps. While some of us stayed at home base to sort through footage, a few of us were lucky enough to check out the musical guest for the event. 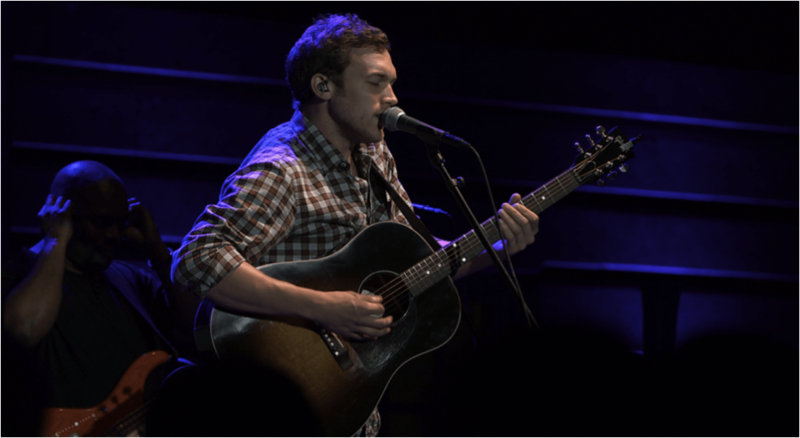 The lucky ones were able to shoot and watch Phillip Phillips perform with his band, just for the C360 audience. None of us had seen him live before and he did not disappoint. If you have only seen him on American Idol, the reality show did not do justice for his musicianship or ability to hold an audience. Phillip Phillips and his band rocked our proverbial socks off. 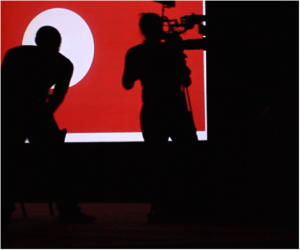 There was about 10 hours from when we stopped shooting footage til whe we had to turn in our finished product. Needless to say, we were fighting against the clock. We worked through the night to collect and edit the best footage from the dozens of hours we had from the last two days. Just as we were finishing up our final edit, a wrench got thrown in the mix and we had to change every lower third graphic we used in our entire piece. Thankfully, these were built in after effects and edited in adobe premiere. Upon re-exporting the graphics they automatically replaced the incorrect versions in our edit timeline. Finally our creation was ready to air in front of the entire C360 crowd. It was a fun, exciting and challenging project, but in the end, we produced and turned around a piece that we were proud of and our client was thrilled to receive. When we said our goodbye to Nielsen C360 2015, we left knowing we gave it everything we had and satisfied our client. We also received the best reward possible, an invitation to shoot Consumer 360, 2016. See you next year, in Vegas!